As summer screeches by with no sign of slowing down, we're left grasping for one last cool drink, and a chance to reflect once more on the movies that were. Where were we? Ah, yes. Cool drinks. Rim the edge of your desired glass with a lime wedge and dip in salt. Fill the glass with ice. Fill a cocktail shaker with ice and the first four ingredients. Shake vigorously for 15-20 seconds. Strain the contents into the salted glass and garnish with fresh mint springs. 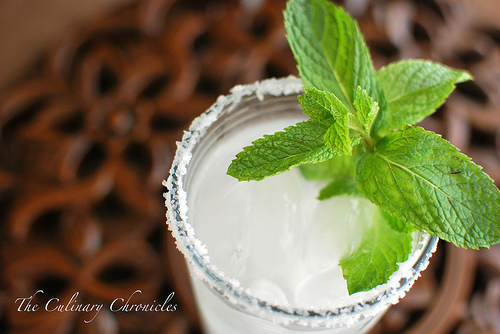 *To make mint simple syrup, add 1 cup sugar and 1 cup water in a saucepan. Bring to a slow boil, stirring until sugar has completely dissolved. Remove from heat and add 1 heaping cup roughly chopped fresh mint. Allow to steep for 15 minutes. Strain the mixture through a fine mesh strainer, discarding the leaves. Refrigerate leftover syrup in an airtight container and use within 5 days. Are you like us and see more than two movies in theaters per month? MoviePass might be a great option for you! For only $35/month (only $30 in some areas) you can see a movie in almost any theater nationwide every 24 hours! It's saving us a ton of money and stress, and we recommend it (especially when ticket prices here in NYC are as astronomically high as they are). Disney/Pixar's latest, Inside Out, got us thinking about our favorite animated films, and what better way to proclaim our love than with another movie showdown! And alcoholic drinks and animated features go together like broken glass in potato soup, so cheers to our 21st episode of CineDrunk! With so many films to choose from, we split the competition into four groupings: Pixar, Classic Disney (Snow White and the Seven Dwarfs in 1937 through Oliver & Company in 1988), the Disney Renaissance (The Little Mermaid in 1989 to present), and the broad and expansive Non-Disney Animated Films category. Part One of our podcast showdown features the Pixar and Classic Disney match-ups. Over drinks, naturally. Combine ingredients over ice. Stir and serve. Working from a master list of all Pixar feature films and all Disney Animated Classics from 1937-1988, we each ranked our personal top eight and then blindly compiled the results to determine a collective top eight in each category. Follow along with an Owl's Brew Classic with Gin, and stay tuned for Part Two to see which film emerged victorious as our Favorite Animated Film EVER! By the end of the year we'll be halfway through the second decade of the 21st century, so it's the perfect time to look back on the first decade, yes? Well, I'm going to anyway. Humor me. This list does not necessarily comprise what I think are the 10 greatest films of the decade, but rather the ten (plus) movies I think of when I think of the years 2000-2009. It was a defining decade for me: At its start, I was a freshman in high school; by its end, I had moved to New York City with the guy I would eventually marry (hey, Munch!). The films I saw in those ten years proved just as influential as my out-of-theater experiences and deepened my love of the cinema (and, for better or often worse, the Oscars). Again, if I were to compile a ranking of the "best" films of the aughts (have we decided that's what we're calling that decade or is this still up for debate? the 2000s? ), it would look slightly different than the following in both the movies included and their placement on the list. And full disclosure that I'm totally cheating with numbers six, eight, and nine...but, my list, my rules.